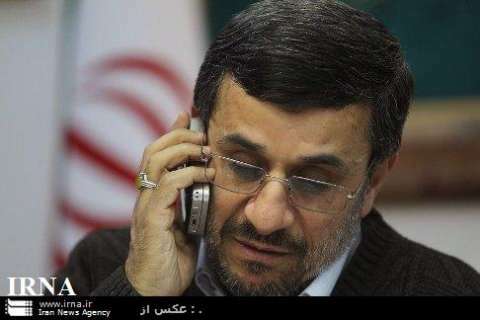 Iranian regime President Mahmoud Ahmadinejad hailed the great victory of Hamas over Israel. Iran’s President Mahmoud Ahmadinejad has hailed the great victory of the Palestinian resistance movement against Israel, saying Zionists have reached the end of the line. “Zionists have reached the end of the road and have no choice but to recognize and yield to the absolute right of the Palestinian nation,” Ahmadinejad said in a telephone conversation with democratically-elected Palestinian Prime Minister Ismail Haniyeh on Saturday. He added that the path chosen by the people in the Gaza Strip and the resistance movements would lead to dignity and freedom of all of Palestine. The Iranian chief executive expressed hope for the liberation of the holy al-Quds (Jerusalem) and the establishment of justice across the globe through joint efforts of all Muslim nations. Haniyeh, for his part, thanked the support of the Iranian government and nation for the Palestinian people against brutal attacks of the Israeli regime. The Palestinian people firmly insist on their principles and will never withdraw from their stance, he said.